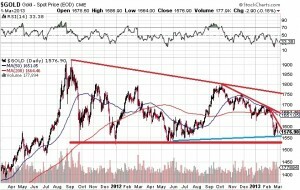 If you are a gold investor, and I am, the short term outlook for gold looks terrible. 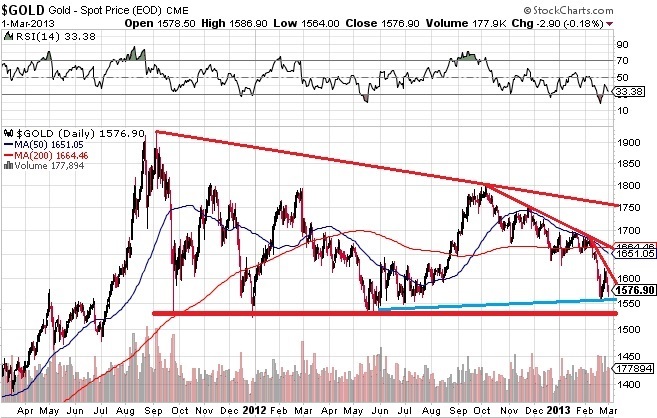 We are very close to long term support levels, and if those levels are breached to the downside, we could see $1,400, or even $1,200 gold. To be clear, I am not predicting a long term bear market in gold. The Bernank keeps printing money, and the sequestration mess (which reminds me of three year old boys yelling in a sandbox) will only make matters worse. Unemployment is higher than the government will acknowledge, and virtually every country in the world is depreciating their currencies to see who can get to the bottom first. I’ve added the emphasis in the above quote, but there you have it: Our elected leaders realize that we don’t really need to make the hard choices, because people around the world will lend us an infinite amount of money. Alas, that’s not true. Once the Chinese have used our worthless dollars to buy every company in North America, they will no longer need to lend us money so we can buy their goods. They will already own everything they need. It is inevitable that we heading for inflation, and probably worse, and it is inevitable that we will see much higher prices in dollar-denominated gold. But inevitable and imminent are not synonyms. 1 Sell everything. If gold is likely to go to $1,500, sell every gold share you have today, and sell your bullion. Then, when gold hits $1,500, start buying, and buy more for every $50 drop, until you are fully invested at $1,200 (or wherever you think the bottom will occur). This plan has the advantage of limiting your risk, and if gold does suffer a big correction, you can buy back in at much lower prices. If you play it right you may be able to convert 100 ounces of gold today into 120 or more ounces at the future, lower prices. This strategy is perfect if you know exactly where the bottom will occur, and if you will be disciplined enough to buy back in at that moment. “That moment” will be a time of “blood in the streets”, a time of maximum pessimism, so you will need nerves of steel to buy while everyone else is giving up. It’s a difficult strategy, requiring nerves of steel. 2 Sell some, but not all. A less drastic strategy is to lessen your exposure to precious metals shares and bullion, perhaps by selling 20% or 40% of your holdings over the next week or two. That frees up cash, and lessens your risk if the market continues downward. Of course if we are near the bottom, you are selling at exactly the wrong time. 3 Buy. Buy a lot. The alternate approach would be to assume we are near the bottom, and these are great prices, multi-year lows, so now is the time to “fill your boots”. That approach will take cash, and nerves of steel. 4 Buy puts. 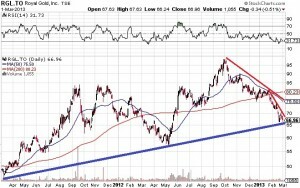 You could buy some insurance by buying puts on stocks you own, or on market proxies like GLD. If you expect weakness over the next month or two, you could buy April or May puts. (As a refresher, puts are the right to sell something, so they go up in value when the underlying security drops in value). In this example, just holding the shares causes a $7 loss, but by buying the puts you only lose $5. You still own the shares, and as they increase in value you get the profit. You also continue to receive the dividend. 5 Sell calls. The other option (no pun intended) is to sell call options against the shares you already own. In this example, just holding the shares causes a $7 loss, but by selling the calls you only lose $2. You still own the shares, and as they increase in value you get the profit. You also continue to receive the dividend. Let me emphasize that this is just an example; the actual prices you get when you “pull the trigger” will be different, which may impact the profitability of this transaction. In this example I am over-stating the cost of the puts, and under-stating the proceeds on selling the calls (because this is an illustration, and I prefer to use round numbers), but you get the point. Personally, I prefer to sell calls, as opposed to buying puts (or buying calls, for that matter), because options are a depreciating asset. Selling a call option means I am selling something that is eroding in value each day. Even if the stock doesn’t drop, the option loses value each day. I like that. be disciplined enough to sell the stock, and then buy back in at the exact bottom. So, what did I do on Friday? Why? Because, while it is quite possible that Royal Gold and all of the other precious metals stocks will continue to fall, it is also possible that the end of the correction is near. As the chart shows, Royal Gold is now down to it’s two year trend line, at a Relative Strength Index level that’s so low (31.73) that a bounce upwards is likely. If we are near the bottom, what’s the point of selling calls, or buying puts, to limit my upside? I considered selling the March 68 calls, but I’d only get about $1 for them. With stock trading at just under $67, if the call options are trading at $1, that implies that there is virtually no time premium. Since the options still have two weeks to go until expiration, I don’t see the point in giving up the upside over the next two weeks for nothing. So, I will monitor the situation each day. If we have a three day rally, I may sell some short term, out of the money calls if the premiums are decent. If not, I will sit and wait. I’m in no hurry. I’m not buying on margin. I’m not using borrowed money. I can wait a week, or a month, or a year. I can wait two or three years. I’m in no hurry. If we have a crash, I have cash and I will deploy it. If not, I’m comfortable with my positions. Keep your seat belts fastened, and enjoy the ride.